PA Senator Camera Bartolotta | Community Options, Inc.
On March 16, state Sen. Camera Bartolotta visited two homes operated by Community Options – a two-bedroom home in Canonsburg and a one-bedroom home in McMurray. Bartolotta spent time speaking with the residents to learn about the services they receive from Community Options. 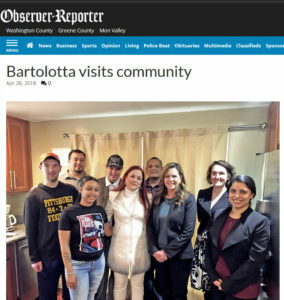 “I am grateful to Community Options for providing me with the opportunity to visit with these residents and learn more about their day-to-day lives and experiences in the community,” said Bartolotta, who represents District 46 in the Pennsylvania State Senate, and is a member of the Community, Economic & Recreational Development Committee. 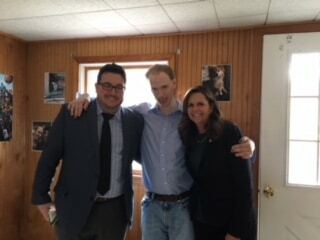 Community Options Inc., is a national nonprofit in its 30th year of serving individuals with intellectual and developmental disabilities by providing residential and employment support services. Pictured, front row, from left, are Joelle White, direct support professional; Karen Langol, program manager; Bartolotta; Ashwini Pednekar, coordinator of program services; and, back row, Stephen Skirble; Nick Carnicella, program specialist; William Jones; Dean Smith, Option Quest program manager; and Kristy Smith, executive director. 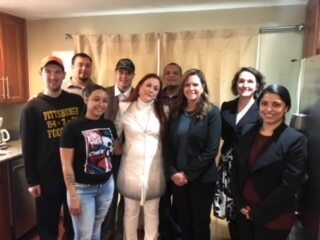 WASHINGTON, PA – Senator Camera Bartolotta visited two homes operated by Community Options in Cannonsburg, PA on Friday, March 16th. Bartolotta visited a two-bedroom home in Canonsburg and a one-bedroom home in McMurray. The Senator spent time speaking with the residents to learn about the services they receive from Community Options. Bartolotta represents District 46 in the Pennsylvania State Senate. She has served in the legislature since January 2015, and is the first women to ever represent the 46th District. As a member of the Community, Economic & Recreational Development Committee, she works directly on legislation that can have a significant impact on people with disabilities living in the community. Community Options, Inc. is a national nonprofit in its 30th year of serving individuals with intellectual and developmental disabilities by providing residential and employment support services. COI currently operates over 160 homes in Pennsylvania, more than any other state. The Washington County office was established in late 2017 to help fill the need for additional services in the region.